Today is the big day! 10:10: Life to the Fullest has officially released, and I’m so excited to see where this all goes!!!! I’m blogging each day this week on an important facet of the book, and today I’m going to take advantage of a provision that I have in my contract with my publisher (as a side note, they have been amazing to work with!) I’m allowed to reprint up to 1,500 words from 10:10 in my blog, so I had to be judicious about where and when I did that. So I decided today is the day! One of the people that has helped me [in the quest to gain a more comprehensive vision for Biblical faith] is Dr. Klyne Snodgrass. An accomplished author and Biblical scholar, Dr. Snodgrass has spent his entire adult life studying the New Testament in particular. At the root of what’s missing, he suggested, is an incomplete understanding of faith. He thinks we have our emphases in reverse when it comes to faith. His primary illustration of this is how we talk about Jesus “coming into our heart.” In most Christian circles we frame the conversion process around this language. When a spiritual seeker is prepared to surrender their life to Christ, we encourage them to ask Jesus to come into their heart. This inward focused, individualized language continues to shape the way we think about spiritual growth even as a Christian matures in their faith. Is it bad to ask Jesus to come into your heart? Of course not. Jesus Christ is everywhere, including in our heart. But Snodgrass’ point is that the level of emphasis we place on this doesn’t match the level of emphasis it receives in the Bible. He had people raise their hands, and nearly ever person in the room said that they had primarily heard faith described as Christ being “in us.” This did not surprise Dr. Snodgrass – it is what he finds to be the case everywhere he goes. The problem with that is that inviting Jesus into our heart is just the very tip of the iceberg. According to Snodgrass’s research, Paul uses the language of Christ “in us” five or six times in the New Testament. But when you contrast that to the frequency of us “in Christ,” you discover that the number jumps to an astonishing 164 times! “But,” he asks, “If you and all other human beings are in Christ, as well as all of Creation, then how big is Christ?” His question needed no answer – the point had been clearly made. We need a bigger and broader vision of faith. 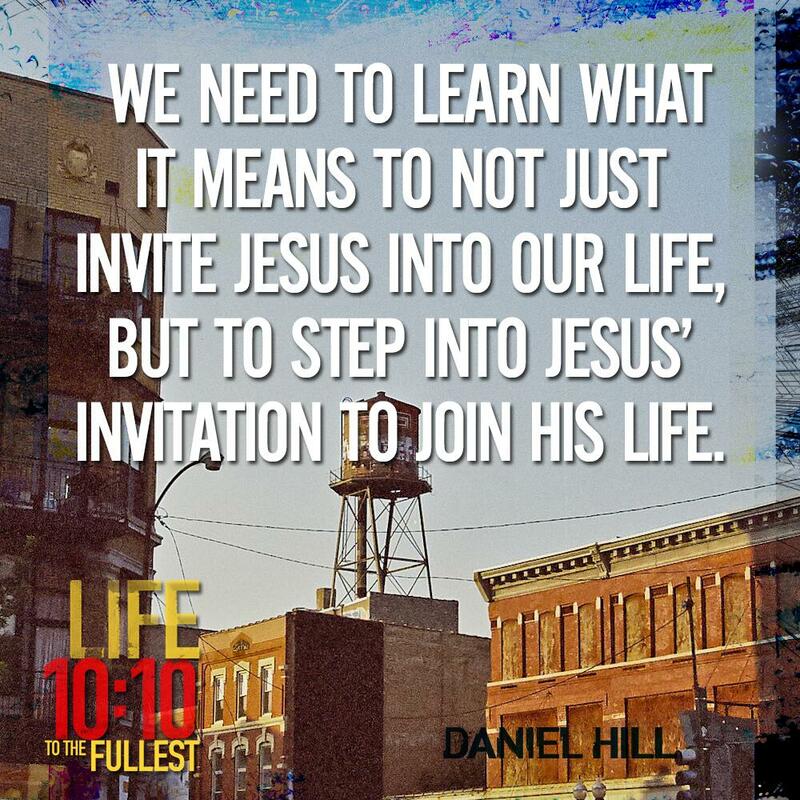 We need to learn what it means to not just invite Jesus into our life, but to step into Jesus’ invitation to join his life. If faith is strictly the means by which Jesus enters into my heart, it is an accurate but limited view. It leaves me feeling as if I am the one in control, with Jesus at my mercy, even if that is not what I believe on a conscious level. He goes where I go, rather than the other way around. It leaves me vulnerable to a life unchanged. The danger of this view is that I relegate Jesus to the role of spiritual add-on, and he is not unleashed to act as the spiritual force that he actually is. If I am “in Him,” versus Him being “in me,” I am no longer in control of my life. I am anchored in Christ, and to what Christ values, and to what Christ says. What Jesus Christ does and where Jesus Christ goes now becomes the dominant narrative of my life. When Jesus moves, I move. When Jesus heads into unchartered waters, I go with him, even if I am filled with fear. When Jesus leads me into the unknown, I go into the unknown with him. I can’t not go – I am cemented to him by faith. Do you see how profound of a difference that is? If I remain in control of Jesus, then I have little hope for experiencing the fullness of life that God has designed me for. But when I see that I am cemented to Jesus, then he is the one that is in control, and he can lead me to that fullness of life – however he sees fit. I agree wholeheartedly with his assessment. It can be difficult to make the transition from living from a paradigm of Christ “in me” to living from a paradigm of my life “in Christ.” It’s not always clear what that means or how to do it. Yet when we hear it, something tells us that it is exactly what we need to learn. The purpose of this book is just that – to paint a Biblical picture of holistic, multidimensional faith, and to inspire and equip you to step into that as a new dimension of life in Christ.